The WatchGuard tech bootcamp series of webinars focus on real-world implementation examples of WatchGuard’s security offerings. 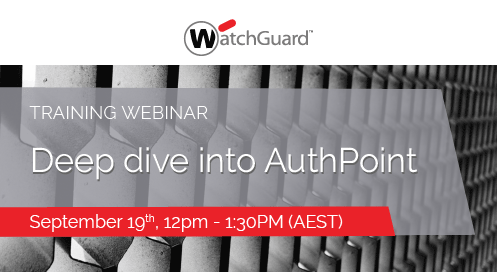 This webinar will focus on WatchGuard AuthPoint. WatchGuard AuthPoint is a Multi-Factor Authentication (MFA) solution designed to protect against stolen credentials and integrates with our own products but also many others that customers use in today's market including Office365, Salesforce, Amazon and Google. In this webinar, our Sales Engineer, Pete Fraser will explain and demonstrate how AuthPoint should be configured with Active Directory to protect SSL VPN connections and WatchGuard Firebox logins. Pete will also show you how Authpoint uses SAML to provide a simple and effective Single sign-on experience.